Drug errors in England cause appalling levels of harm and deaths, Health Secretary Jeremy Hunt says, as data suggests mistakes are being made. GPs, pharmacists, hospitals and care homes may be making 237 million errors a year - the equivalent of one mistake made for every five drugs handed out. Drug errors could be a factor in thousands of deaths a year. The researchers - drawn from Manchester, Sheffield and York universities - acknowledge that there is limited data in this area so the figures are very much best estimates based on previous research, some of it going back years. They estimate that drug errors cause 700 deaths a year and could also be a factor in between 1,700 and 22,300 other ones. A fifth of the mistakes related to hospital care, including errors made by doctors administering anaesthetic before surgery. The rest were pretty evenly split between drugs given in the community by GPs and pharmacists, and those handed out in care homes. In total 1.15 billion drug prescriptions are made each year. One of the people who suffered from a drug error was Catherine Young's mother, Irene. She was living in a care home and was aged 92 when she was given a host of wrong drugs for several weeks after her prescription was mixed up with another patient's. It meant she stopped getting steroids for polymyalgia rheumatica, which causes pain, stiffness and inflammation in the muscles around the shoulder, neck and hips. This caused her to go into withdrawal, while she developed irritation around her eyes because she had started being given eye drops she did not need. Ms Young, from Suffolk, said the mistake had been missed by the GP, pharmacists and care home staff and spotted only when she had questioned the medication after noticing her mother's condition had been deteriorating. "It was down to me, a layman with no medical training, to sound the alarm. "Thankfully we were able to act in time, but others have not been so lucky." Royal College of Nursing chief executive Janet Davies said the study was "deeply concerning". She added: "There is real problems in preserving patient safety when you haven't got enough staff and when we've got the financial pressures we have." She said human error is "one of the biggest risks" and that overstretched nursing staff and agency workers put "added risk in" the system, but certainly did not make errors inevitable. 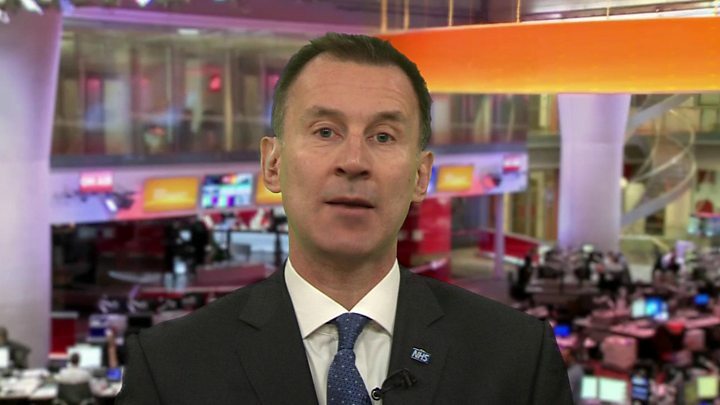 Mr Hunt said he was concerned by the findings - although he pointed out that the research showed this was a global problem and not one unique to the NHS. "It is a far bigger problem than generally recognised, causing appalling levels of harm and death that are totally preventable." In a speech to a patient safety conference in London on Friday, Mr Hunt is expected to outline steps the NHS is taking to reduce mistakes. These include the continued rollout of the much delayed electronic prescribing - only a third of hospitals have an effective system in place. The Department of Health and Social Care believe the roll out of electronic prescribing systems across more hospitals could reduce errors by 50%. In his speech, Mr Hunt will also say there needs to be greater openness about mistakes, so the NHS can learn from them. A change in the law is being introduced that will mean pharmacists will not be prosecuted for owning up to genuine mistakes. Prof Helen Stokes-Lampard, of the Royal College of GPs, said doctors "work hard to avoid making mistakes" but were only human. The "intense pressures" on the front line would also be contributing to the problem, she added.